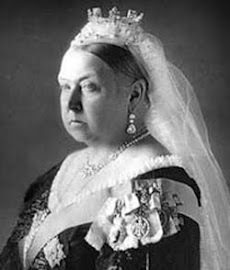 "Victoria, Queen: removes one of her undervests, 9; speaks highly of Bubble & Squeak, 11; refuses a goat chop for breakfast, 15; contrite about not opening an Aberdeen waterworks, 15; has golden syrup spilt over her, 26; runs, jumps, and somersaults, 29; walks on a tightrope, 33; shot out of a cannon, 37; dons eagle's wings, 40; swings through a forest, 40; makes balloon ascent, 42; plays tiddlywinks with Miss Biggy the Fat Lady, 53; imitates a hen, 65; bargains for a goat, 66; visits a dubious establishment, 71; involved in a bar brawl, 71-72; in prison, 72; with hiccoughs, 77; upside down, 86; catches a packet, 88." Jamaica Holiday: The Secret Life of Queen Victoria by Jonathan Routh, first published in 1979, purports to be the diary kept by the queen during an incognito visit to the island in 1871. 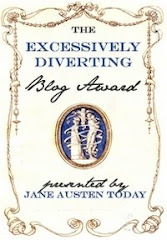 The queen gets up to all sorts of adventures, all related through wry prose and more than three dozen whimsical paintings. She goes golfing and water skiing, learns to limbo dance and twirl the hula hoop, consorts with a sugar planter who prefers not to wear clothes, and smokes the wacky weed, among many other improbable, and hilarious, things. This charming book is out of print but used copies are readily available from a number of online booksellers, including Amazon. Shown here: The queen goes bicycling with her cheetah on a Jamaican beach. 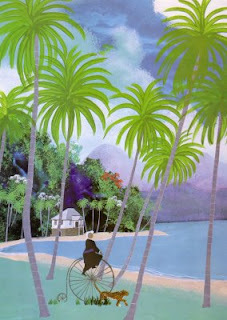 Painting by Jonathan Routh, Jamaica Holiday: The Secret Life of Queen Victoria.